Few artists who adopt printmaking as their primary means of expression achieve international critical acclaim. 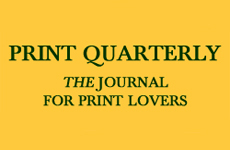 Museums and collectors often prefer prints by artists who have established reputations in painting, sculpture or installation work, their printmaking fitting into an overall hierarchy that values the unique over the multiple. Christiane Baumgartner is an exception, an artist of international stature who has chosen printmaking as her principle activity. Baumgartner has furthermore adopted the earliest form of printmaking, the woodcut, as the medium through which to engage in a concerted investigation of image making. To compound this, the majority of her works, her signatures pieces, are large-scale monochrome prints, predominantly black on white. This is certainly not the strategy of an artist seeking a quick fix or instant attention. Baumgartner was born in 1967 in Leipzig, a city in which she has lived for most of her life. The first half of that life—her formative years—were spent in East Germany under communism, the second half, as an adult in the democratic unified Germany. Her work seems to embody this balancing of extremes. A sense of duality connects many aspects of her practice, not least in the manner in which she brings together two distinct technologies: woodcut, the earliest form of image reproduction, and the digital technology through which her images are gathered, filtered and prepared for printing. Duality is also clearly apparent in the contrast between the black ink and the white of the paper, between the mark and its absence. Like woodcut, digital tools are predicated on the principle of on or off. There is no scope for in-between. Fig. 1. Christiane Baumgartner, Transall (2002-2004), woodcut, 154.9 x 435 cm. Edition of 6. Image courtesy Christiane Baumgartner, ©VG Bild-Kunst, Bonn 2011. 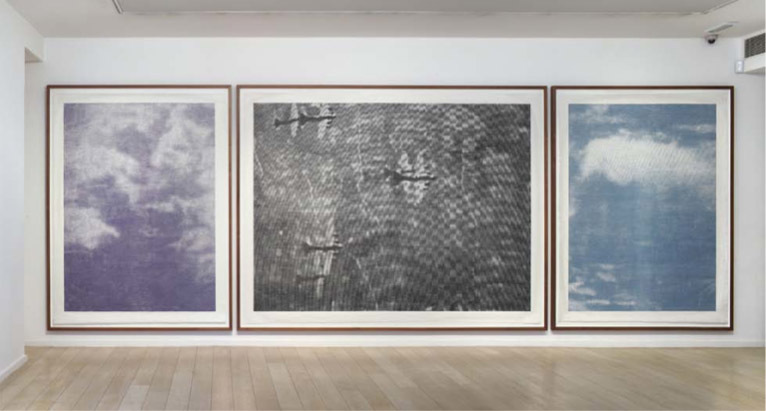 In London this past February Alan Cristea Gallery presented an overview of Baumgartner’s prints of the last decade, from the monumental 2002 woodcut Transall (155 x 432 cm, Fig. 1) through her recently commissioned work for Birmingham Museums and Art Gallery, entitled Ladywood, a diptych that spans over five meters in length. (The exhibition can be seen at Museum Franz Gertsch in Switzerland, 26 March – 4 September, under the title “Christiane Baumgartner—Schnitte ins Herz und in die Augen”). What is immediately apparent in viewing these works was that, in addition to the aforementioned sets of oppositions, balancing the languages of abstraction and figuration is, for Baumgartner, an overwhelming concern. Baumgartner’s work sits squarely within some of the key themes of recent German art. In her landscapes of ploughed fields and woodlands one senses Kiefer’s reclamation of the landscape as a site of memory, while in the oscillation between figuration and abstraction, Gerhard Richter is clearly influential, as is his use of photographic source material. But perhaps it is the work of Bernd and Hilla Becher, in their detached, systematic and serial photographic documentation of the industrial landscape, that chimes most clearly with Baumgartner’s vision. In a recent public conversation with Baumgartner at Chelsea College of Art & Design, London, we spoke about the qualities of print and of representation that have intrigued her and directed her development. Her statements appear below in italics, interspersed with the author’s observations and commentary. Fig. 2. Christiane Baumgartner, Grid (1999), stills from video. Image courtesy Christiane Baumgartner, ©VG Bild-Kunst, Bonn 2011. Baumgartner studied printmaking at the Hochschule für Grafik und Buchkunst in Leipzig before spending two years in London at the Royal College of Art (1997–99) on the Masters course. In Leipzig she learned the skills of printmaking and developed an interest in the book as an art form. Some of her early books, in particular a modest volume based on Goethe’s Faust, point to some of the concerns that she developed later—the idea of time, the engagement with the viewer in reading an image, and the tension between a formal approach to abstraction and the source image. Paradoxically, having been accepted onto the Printmaking Masters course at the RCA, she did very little actual printmaking, preferring to explore her ideas through video, which she used for recording. In one telling piece, Grid (1999) (Fig. 2), made from a basement bookshop in Charing Cross Road, she recorded the light that fell through a grid of glass panels from the pavement above. To begin with, the image can only be read in terms of abstraction, white squares within a soft black grid, and it is not until a figure walks over the panels that the figurative source of the image is made visible. One moment it is an abstract grid, the next, an image of passing figures. There is a tension between these formal concerns: the grid, the relationship between dark and light and between figuration and the narrative. It also is a work that marks out a concern with a section of time, much as in Warhol’s films, such as Sleep (1963) or Empire (1964), as well as with the use of the lens as a fixed impassive stare. Her dual interests in video and printmaking coalesced when she left London after graduate school. Fig. 3. 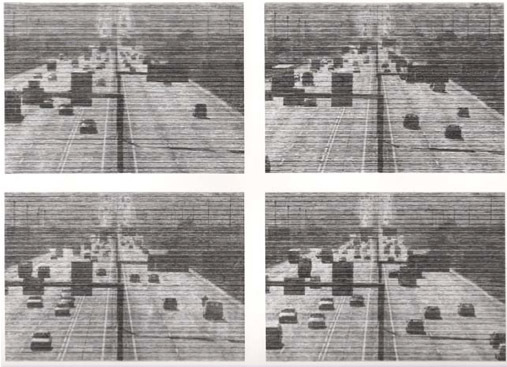 Christiane Baumgartner, Lisbon (2001), four woodcuts, 98 x 128 cm each. Images courtesy Alan Cristea Gallery, ©VG Bild-Kunst, Bonn 2011. The first piece in which these two technologies were brought together was Lisbon (eventually a set of four large scale woodcuts) made in 2001 (Fig. 3). In this work she managed to establish a practical working method not only to bring together digital and manual technologies but also to place time, its passing and perception, at the forefront of her art. She worked from stills taken from a video that she shot from a motorway bridge, looking down onto the road. Her working method at this time was to select a still, manipulate it through Adobe Photoshop, impose a filter of horizontal lines reminiscent of the scan lines of analogue video, trace this onto a sheet of wood and then meticulously, using simple knives, cut the block, a process that could involve months of painstaking labour. Her blocks are too large for a press, and must be inked and printed by hand, systematically rubbing the paper until the entire image is printed. Fig. 4a. Christiane Baumgartner, installation view of 1 Sekunde (2004), portfolio of 25 woodcuts, 26 x 33 cm each. Edition of 25. Image courtesy Alan Cristea Gallery, ©VG Bild-Kunst, Bonn 2011. In Transall (2002) the scale in Baumgartner’s work became monumental. The image was taken from a small photograph in Der Spiegel of transporter planes waiting on the tarmac. It was as if she was making a physical equivalent to the weight of the plane. In the hands of Baumgartner the image was transformed into one of latent power, prompting incredulity that a structure of that size could ever fly, and carrying a sense of threat and menace. 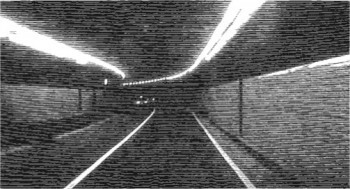 The matrix of parallel lines she used to structure the image invokes surveillance, the degraded images from closed-circuit video monitors, and adds another level of anxiety. For or all its monumentality and physicality, the image is not stable; it exists in flux, the plane dissolving into abstraction as the viewer approaches to view it up close. Transall is rare in Baumgartner’s work in that its source was a single found photograph. 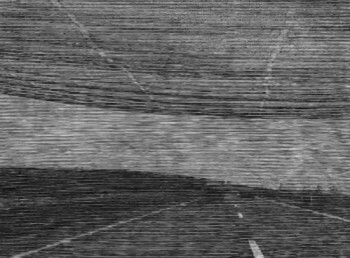 Typically her images are drawn from the videos she takes during car journeys with her husband Andreas, which explore ideas of time, motion and speed. While in Transall these ideas are latent, her subsequent work makes these themes central. 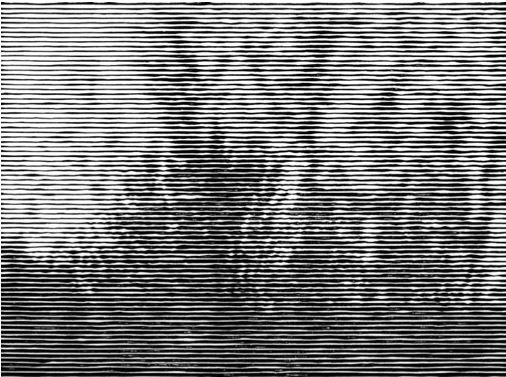 In 1 Sekunde (2004) she took 25 frames from one second of video and cut each individually as a woodcut to make a printed equivalent of a filmstrip, a section of time made concrete (Figs 4a, 4b). Fig. 4b. Christiane Baumgartner, 1 Sekunde (2004), one from the portfolio of 25 woodcuts, 26 x 33 cm. 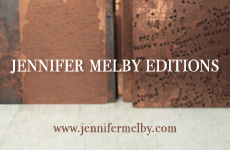 Edition of 25. Image courtesy Alan Cristea Gallery, ©VG Bild-Kunst, Bonn 2011. The viewer is led from one image to the next, each completely different but sufficiently similar to the next to disrupt any easy reading. The work also exists as an artist’s book, its small scale operating like a flicker book, again contrasting movement with stasis, and enlisting the viewer an active participant.7 As in her videos, the only narratives are of time passing and of speed. Once again there is the contrast between the fraction of a moment needed to capture an image, and the commitment of hours, days, months of cutting the blocks to realise the project. Though for all this single-minded devotion to craft, the success of these images does not lie in their undoubted technical accomplishment, but in their directness of means to realise her intention. She doesn’t indulge in the craft: it’s a job of work to be done; the technique is totally embedded within the conceptual framework of the ideas. Baumgartner explores what it is to look. Video, recording as it does so many images per second, allows us to experience more than we can consciously see. We experience time anew through media, more real than real. Today we are invariably in motion: in cars, in trains, walking. As the pace of life speeds up, conversely our capacity to scrutinize a fraction of a second becomes ever greater. The slow motion shot reveals every stage within an action, and likewise the stop frame turns every instant into a new composition. Baumgartner looks at this instability and what it means to attempt to capture a moment. She freezes them in order to subject them to intense examination and scrutiny. Fig. 5. Christiane Baumgartner, Skyline (2007), woodcut, 141 x 180 cm. Edition of 6. Image courtesy Christiane Baumgartner, ©VG Bild-Kunst, Bonn 2011. 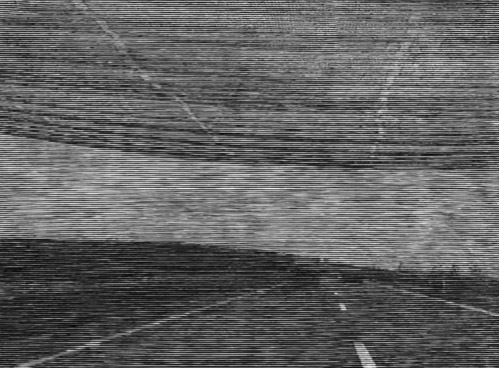 In Skyline (2007), Baumgartner recreates the experience of looking out the front of a car to an always-distant horizon where the road ahead seems like a never-ending ribbon (Fig.5); in Triptychon (2005) the view is to the side as the landscape flashes by. The video footage is analysed and picked over in the studio, re-running time, re-experiencing the speed of passage. As with her very early videos, her method is fundamentally about choosing a position for the camera and recording what passes. This dumb use of video connects her work with the myriad systems of surveillance cameras that dot our cities. Perhaps, for Baumgartner, having been brought up under the watchful eye of the Stasi (estimates suggest that one in fifty of the DDR population were informers) this means of recording takes on an added poignancy.8 The strength of her images is that they hover between innocence and menace. 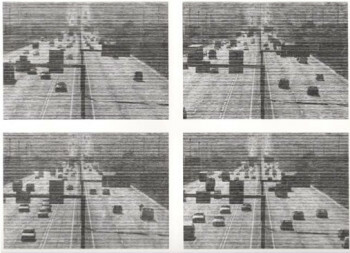 The landscapes and cityscapes that form the bulk of her work are liminal spaces, in-between places, those places without names, one section of motorway much the same as any other across Europe. As with the Bechers’ photographs, she is engaged in cataloguing the unremarkable with an objective dispassionate eye. For the four print series titled Solaris (2008) (Fig. 6), she selected scenes of motorway underpasses from video footage, filmed from a car in motion. These spare images are predominantly black, the lights from the underpass serving not to illuminate but to guide. Together with the edge of the road they form markers for an exploration of single point perspective, as the viewer is drawn towards the elusive vanishing point. On one level they are straightforward, connecting to an experience we have all had while driving long distances, particularly at night when the eye is fixed forward, relying on the minimum of clues to keep on track and safe. But the prints also suggest that feeling, induced by travel, of being alone, in-between places, needing to be watchful, aware of the security of being inside the car and aware of the threat outside. Fig. 6. Christiane Baumgartner, Solaris 1 (2008), from a series of four woodcuts, 140 x 240 cm. Edition of 6. Image courtesy Christiane Baumgartner, ©VG Bild-Kunst, Bonn 2011. In a similar vein, her landscapes are planted woodlands with regularly spaced trees, or the ploughed fields, or the ghostly wind turbines that are such a feature of the journey between Berlin and Leipzig. These seem like places of secrets, sinister locations from film noir, landscapes that have all been marked by the presence of man. In Deutscher Wald (2007), a series of nine woodcuts printed in crimson, she explored the limits of perception by reducing the image resolution to a mere 3 dpi. 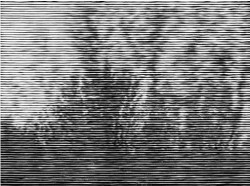 This low visibility not only compels the viewer to find a distance from which the image can be visually reconstituted, it also imposes a coarse, pixelated structure across the surface of the image. What on one level is a natural scene of nature becomes codified through the language of the computer into an image that reveals its own making, in much the way in which Impressionist artists a century earlier made apparent that a picture was paint, and patches of colours set side by side, that could coalesce to form a new vision of reality. In her recent work, Baumgartner has developed new imagery using videos taken from TV documentaries about the second World War. In the triptych, Luftbild (Triptychon) (2010), the central image depicts fighter planes in the sky (Fig. 7). To either side, woodcuts of sky are printed in blue. 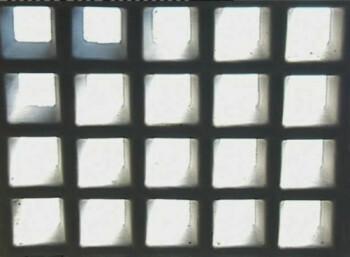 The central image is the subject of much distortion, a consequence of filming directly from the TV monitor. The image hovers on the brink of abstraction, the interference imposing a texture across the whole surface of the print. While this provides exciting challenges for the physical cutting of the block, it also acts conceptually as a further layer of filtering through which the image must travel. It makes visible how elusive memory can be and how images subjected to transmission erode, leaving the viewer clinging to shadows and traces. These World War Two scenes were originally taken on film stock for projection, then adapted for analogue TV, which has been reconstituted as digital data for transmission, which has been captured on video prior to translation through Photoshop, and then returned to the physical world as the final woodcut. At every stage of this process something is lost and something is added. What finally remains is like a ghost, a distant memory caught at the point of disappearing. The simple blue panels on either side act as counterpoints to the complex central image, suggesting a different time, a more recent time when colour superseded black and white. Baumgartner’s art is perverse. A fleeting second, a random video frame depicting a scene of no inherent importance, become the subject of intense physical effort over months, and in some cases years, as she transforms these chimeras into woodcuts. 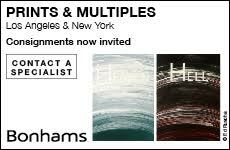 These are profound works that engage with contemporary themes and anxieties and demonstrate the vitality of printmaking as both a process and means of interrogating the world. In engaging in this dialogue between technologies —between digital and analogue, video and woodcut—she places herself outside of the clichéd image of the dedicated printmaker, and within the mainstream of contemporary art. Fig. 7. Christiane Baumgartner, Luftbild (Triptychon) (2010), woodcut, three panels: left: 260 x 202 cm, center: 260 x 350 cm, right: 260 x 202 cm. Edition of 3. 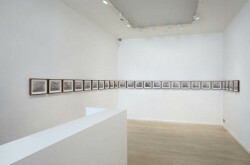 Image courtesy Alan Cristea Gallery, ©VG Bild-Kunst, Bonn 2011.